Certified Breeder of Northern Queens and Bees. Your Mason Bee Provider for 10+ years! Our most important employee......Mother Nature! Our business model involves taking out the 10-20% of the weakest genetics every year. Our no pesticide or mite treatment IPM approach allows a better, stronger genetic pool moving forward. Have a beekeeping Question? You can always email or call Bjorn Apiaries. Local cub scouts fascinated with a beeyard visit. We are NOT taking any further orders for 2019 PACKAGES! Scheduled pick-up will be April 10th or the 11th. Pick one date or the other. See below for Info. You can also pick up at Bees-N-Trees in Hummelstown on April 11th. from 9am to 1pm. We are NOT taking orders for Nucs at this time. 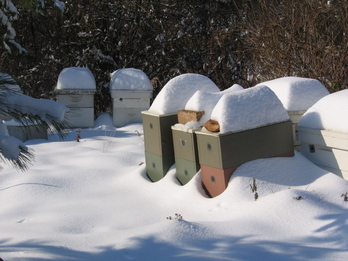 Once we have a handle on how winter plays out, we will offer nucs as they become available. Honey Bee and stinging insect removal: Please click on the "Bee & Swarm Removal" page. Bjorn Apiaries has a Facebook page where we post bee happenings. We also send out newsletter material via the membership list of PennApic. We no longer add beekeepers to the Bjorn Apiaries newsletter mailing list without verifiable name, address, phone number, and email list. Thank you. spring workshop hosted by PennApic and members of the Pa. Backyard Beekeepers' Association. Looking for local raw honey? Bjorn Apiaries is a family owned and operated honey bee business, located in southcentral Pennsylvania. Our operation is focused on maintaining bees and providing mating stock from overwintered nucs and hives, and void of harsh mite treatments and chemicals. All of our bees overwinter in Pennsylvania. Honey and beehive products are produced with a licensed state honey house certificate of inspection. Bjorn Apiaries provides a host of services centered around helping beekeepers in a more natural way of maintaining hives. We have experience with traditional Langstroth hives, Warre hives, Top Bar Hives, Two Queen Tower systems, various comb options, as well as an IPM (Integrated Pest Management) program to foster healthier hives. The pages of this website are filled with our opinions, advice, observations, and experiences. We did not make this site out to be filled with research, other beekeepers experiences, or filled with book filler and academia type data to impress you. All information is from our own collected beekeeping experiences here at Bjorn Apiaries. EVERY picture is from a Bjorn Apiary location. You may not agree with everything we say. And that is ok. The intent of this site is to be honest, while passing on information from another beekeeper who wants to help others enjoy the fascinating world of BEEKEEPING!. We invite beekeepers as well as anyone wanting to get started in beekeeping to contact us for a visit to one of our yards. There is always something going on within the bee community. Please scan the pages of this website for details on classes, information on various types of beekeeping, as well as services and products that we offer. Do not hesitate to contact us with any comments or suggestions. If you have any questions, please click here. We spend a considerable amount of time helping new beekeepers with questions and working out problems. While we do try to reply in a timely manner, there is a busy season, and of course sometimes we are simply away on business or pleasure. Thank you. Have bee questions? Have a facebook page? Connect with PennApic and other beekeepers across the country and around the world. CLICK HERE for the PennApic facebook page. Do you sometimes not know what to say, how to explain, or make suggestions to farmers and homeowners in regards to impacts on bees? Click here. This page is provided by the Pa. Backyard Beekeepers' Association. It explains some issues affecting bees, the details behind the problem, and perhaps a good way to pass along some information. Copyright © 2010-2018 Bjorn Apiaries. All Rights Reserved.